The Chief Medical Director, Ladoke Akintola University of Technology Teaching Hospital, Osogbo, Prof Akeem Lasisi, has testified that the late senator representing Osun-West senatorial district, Chief Isiaka Adeleke, died of an overdose of banned injections. Testifying before a coroner, Mr Olusegun Ayilara, in Osogbo, on Monday, Lasisi, who spoke from the witness box, said the Chief Medical Director of Biket Hospital, Osogbo, Dr Adebisi Adenle, called him on the telephone on April 23 to tell him that Adeleke had died. Lasisi, who said he saw Adeleke’s corpse on a table at LAUTECH’s morgue, added that a pathologist, one Dr Solaja; two resident doctors, who are also pathologists; the Officer in Charge of Homicide, Osun State Police Command; Divisional Police Officer, Dugbe Police Station, Osogbo; and the Consultant Pathologist, LAUTECH, were all present when an autopsy was carried out on Adeleke. The CMD told the court that one of the aides of the late senator told him that the deceased complained of leg pain and somebody treated him. Lasisi said the aide told him that the person, who treated Adeleke was not a doctor but could not say if he was a nurse. The CMD stated that the aide mentioned the names of the various injections administered on him before his death and the aide (in company with other aides) was asked to go and bring them. The CMD stated that he did not ask for the name of the person who treated Adeleke but he wanted to know what was administered and the competence of the person that administered the drugs. He said among the injections given to Adeleke was Analgin, which he said was outlawed when the late Prof Dora Akunyili was the Director General of the National Agency for Food and Drug Administration and Control. He said, “I saw the corpse. Before any process of examination of any diagnosis in medicine, there is what we call history before examination. So, we asked for the person who knew the conditions surrounding the death of the senator. So, the family pointed to one of the aides and the aide said he (Adeleke) was active the previous day and he came at midnight and started complaining of leg pain. So, they sent for somebody who came to give him injections. “I asked clearly the medical status of the person that administered the injections. I asked, ‘Is the person a doctor?’ but he said no. ‘Is he a nurse’?, he said he didn’t know but the person was a face they were used to. “He mentioned various injections, so at that point I asked him if could lay his hands on the empty ampoules of the injections. The family members went home to get them. The injections were five per cent dextrose. We saw empty sachets; it was like a fluid and with it, we saw an intravenous fluid-giving set and scalp vein needle. We saw that empty. We saw two ampoules of Analgin, four ampoules of valium (diazepam) – 10ml each making 40 milligrammes, one ampoule of pentazocine, one ampoule of gentamicin and two ampoules of hydrocortisone. The CMD added that diazepam ‘sedates and tranquilises when given in moderate dosage’ but said it could knock off reflexes if given in the type of dosage Adeleke was given and could eventually lead to death. He stated that if the injection would be given intravenously at all, it should be given at a facility where the patient could be resuscitated with artificial oxygen in case his breathing stopped. Also the Osun State Deputy Governor, Mrs Titi Laoye-Tomori, in her testimony before the coroner, said Adeleke hesitated before he ate three spoonfuls of rice at a funeral ceremony in Osun State, a day before he died. 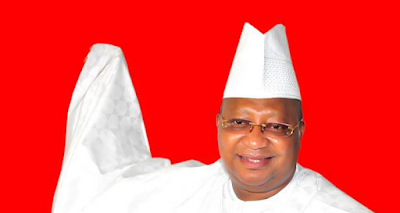 Adeleke and the deputy governor were among the dignitaries, who attended the funeral of the mother of the Chairman, All Progressives Congress in Osun-West senatorial district, Mr Yinusa Amobi, at Kuta, Osun State, on April 22. The senator died the following morning. She told the coroner that she waived her immunity to personally appear before the coroner because of the importance she attached to the probe and to state what she knew about the moment she spent together with Adeleke and others at a social function on Saturday, April 22. Laoye-Tomori stated that she shunned the special chair prepared for her and chose to sit close to Adeleke because the deceased demonstrated an uncommon humility by coming to welcome her beside her vehicle when she arrived at the venue of the ceremony. The deputy governor told the coroner that Adeleke was served rice in an uncovered plate and the rice had no fish or meat and he was hesitant to eat. She said, “A woman brought a plate of rice. There was fried rice, a mixture of ‘jollof’ and white rice. There was no protein in it, that is, there was neither meat nor fish and the food was not covered. I was wondering why a man of his status would be served food not covered but I don’t know whether he was already eating the food before I arrived there or not. “The senator was using his spoon to turn the rice and he was hesitant to eat it. I said jokingly, ‘ Your Excellency, why don’t you ask them to take the food away if you don’t want to eat it? And he said, ‘Se tori wipe kosi eran lori e?’ (Is it because there is no meat on it?). “He said that woman brought a bowl of fish but these people you are seeing ate everything and left nothing for me. He then took his fork and stretched his hand to take a piece of fried fish from someone sitting close to him but his fork couldn’t pick it because the fish was fried.